Baga Beach, Goa, Located just north of Calangute beach, Baga is party central, teeming with tourists all year round. The beach is packed with lively shacks, bars and rows of sunbeds and the sea brims with boats and all sort of water-sports. As one of the few places in Goa with late licensed clubs, it’s the place for drinking and dancing, with a young fun crowd of Indian and foreign visitors. But another side to Baga is also developing, especially on the north side of Baga creek, of fine-dining restaurants and designer boutiques, catering to a more sophisticated crowd. Reflecting the wide range of visitors, Baga beach has diverse accommodation including package holiday hotels, budget guesthouses, luxury boutique resorts and private serviced apartments. Whether a group of friends looking for an affordable crash pad between the pulsating parties, a family wanting a comfortable beach holiday hotel, or a couple looking for a more stylish pad, Baga beach has a good choice of Goa cottages, or old style Goa beach huts. Visitors looking for cheap beach eats are well served by the many shacks lining the shore, but Britto’s stands out with its legendary huge seafood platters. Cavala, with its eclectic menu, long dining tables for sociable group dining and live music is another popular restaurant a stone’s throw from the beach. Fresh breads, cakes and pastries can be found at The Baker’s Studio, an authentic French pâtisserie on Tito’s Lane. For a finer dining experience, head to the Baga Creek, where Le Poisson Rouge serves a French fusion menu, and J&A’s offer a slice of Italy in the pretty garden of a Portuguese villa. 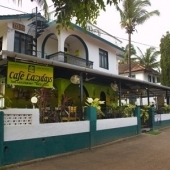 Baga Beach is the home of Goa’s commercial nightlife scene, centred around Tito’s Lane, and the institution that is Club Tito, where international and Bollywood DJs play to revellers packing the huge dance floor. Across the lane, Cafe Mambo club hosts different music nights - house, hip hop, retro and Latino. Slightly more sophisticated nightlife can be found at Cafe La Musica, a chic beachside cocktail lounge which host regular party nights with guest DJs. As well as the shops and stall lining the roadsides, Baga beach is home to Mackie’s Night Bazaar, on Saturdays during the season on the river bank. Artisans from different parts of India sell everything from jewellery and clothes to spices and artwork, and with food stand and live music, visitors can make a night of it! The range of watersports offered on Baga beach is the most extensive in Goa - everything from parasailing to wakeboarding, and the inescapable banana boat rides. Dolphin spotting and fishing trips are also available, and Barracuda Diving is a long-standing school offering regular dives and courses, including PADI qualifications. A Baga beach holiday offers a multitude of fun activities along with a great party atmosphere, with beach action between November and April, and inland Goa restaurants, bars and clubs open all year round.